Manufacturer of a wide range of products which include brass bar straightening machine, ss bar straightening machine, bar straightening machine, copper bar straightening machine, round bar straightening machines and alloy steel bar straightening machine. We are highly experienced firm widely known for the quality of our offered Brass Bar Straightening Machine. Available with us in various technical specifications, these machines are used for the purpose of straightening of brass bar in the most efficient manner. Their consistent performance, reduced noise and enhanced functional life make these machines highly demanded. We are well acclaimed as reliable firm of highly demanded SS Bar Straightening Machine. Different stainless steel bars can be effectively straightened by using straightening machine, which is manufactured by using modern machinery. Known for their superlative performance and overload protection, these machines undergo different quality assurance procedures for ensuring that its quality is always maintained. We have gained much acceptance as the notable firm offering best in class Bar Straightening Machine. 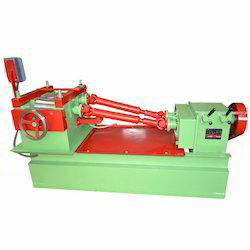 Used for straightening of metal bars, these machines are known for their superlative performance due to their roll angle adjustment. Simple operation coupled with optimum production rate make these bar straightening machines highly demanded. We have attained wide reputation in the market by providing best in class Copper Bar Straightening Machine. Known for their energy efficient design, high performance and easy operation, these machines are used for straightening of copper bars in the most efficient manner. In addition to this, our customers can avail these machines in various technical specifications. We are one of the grand manufacturers and exporters of precisely engineered Round Bar Straightening Machines. Appreciated and accepted for their tough construction, reliable performance and high production rate, these easy to operate machines are widely demanded. Our quality controllers carry out multiple tests to examine the flawlessness of the offered series. We are recognized as the industry leaders by rendering high-grade Alloy Steel Bar Straightening Machine. Ideal for straightening of different alloy steel bar in the most efficient manner, these machines are known for their consistent performance and user-friendly operations. For ensuring high performance, we make use of premium quality of electrical motors and coolant pumps in these products. We have gained huge success in rendering high in demand Aluminum Bar Straightening Machine. With the help of belt drives, the main drive of the aluminum bar straightening machine is taken from the motor For the purpose of straightening of the aluminum bars in the most efficient manner; the rendered straightening machines are used in various industrial applications. We have gained prominence in the domain by offering most advanced Mild Steel Bar Straightening Machine. Appreciated and valued for their reduced vibration and consistent performance, these machines are used to straighten different mild steel bars. For better and superlative performance, the Gear boxes of the mild steel bar straightening machines are fully lubricated in the oil. Shri Ram Krishna Engg. Works is the preferred choice of its customers for offering Steel Bar Straightening Machine.